Use your regular email program — Gmail, Outlook, or Mozilla Thunderbird, for example — or an app on your mobile device to receive and send messages with your Yahoo Mail address in addition to accessing the account on the web using a browser. The IMAP settings ensure that you can access mail in all your Yahoo folders in both email program and browser. You'll also need to configure SMTP settings to send mail using your account. The Internet Mail Access Protocol (IMAP) governs the receipt and viewing of messages; Simple Mail Transport Protocol (SMTP) governs the sending of outbound messages. When you configure IMAP, you'll also always need to configure SMTP. Yahoo Mail also supports Post Office Protocol (POP). POP is an older email standard that governs the receipt of messages. You'll almost surely want to avoid using POP — the protocol, by design, retrieves a message from the server, then deletes it from the server, so it's available only on the device onto which it was downloaded. IMAP, by contrast, syncs messages with the server, so if you use three devices to connect to your Yahoo Mail account, all three will see the same thing. 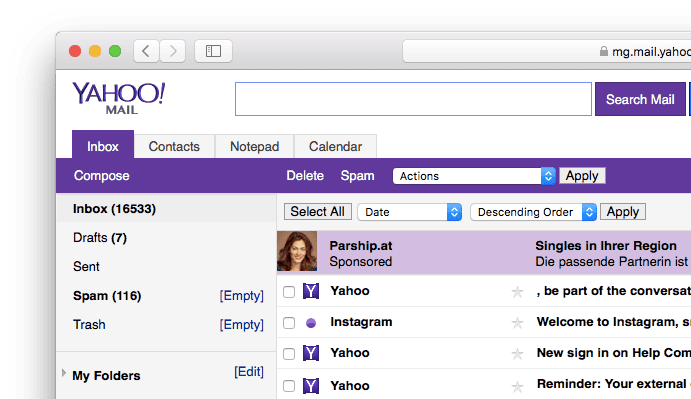 Yahoo Mail supports application passwords; these single-use passwords allow a specific program to access your Yahoo Mail account, without requiring the use of your account password, if you've set up two-factor authentication. It's not uncommon for people to run into account-access problems because they forgot that they had set up their account with two-factor authentication. If you set up two-factor, you'll need to log into your Yahoo account to generate an app password for every computer or mobile device that you'll use for email.